Oh, Google, how you entertain us, the lonely internet-searching, no-good, racist, weird, semi-perverted and definitely gross and disgusting masses that we are. My hubby was the first to clue me in on the hilarity (and despair) of the new Google suggestions feature — you know, the text that pops up when you start typing in a search phrase. You see, part of the Google formula is to pull up text based on the popularity of a search. So, aside from the nerdy things I’m pretty sure Google programmers slipped in (ex. – type in “Google is” and “Google is awesome” almost always pops up), one could assume that the Google suggestions tell us a little about ourselves. And — no surprise here — what it’s telling us isn’t very impressive; in fact, most of the time it’s downright disappointing. Go ahead. Try it. Type in “Why are” (warning: you may lose faith in humanity). OK, here’s a better one, type in “Why does” (warning: you may vomit with the results of this one). 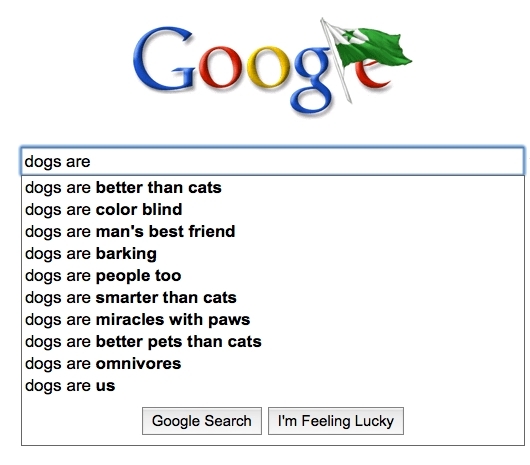 Type in “cats are” or “dogs are” and the whole idea that people use the internet mainly to find information that backs up their already-held beliefs can almost definitely be confirmed (I mean, everyone KNOWS dogs are waaaaay better than cats). Have fun playing with Google suggestions, my friends. And remember; we are only human.